This issue is being sent out against a backdrop of two devastating earthquakes - one smashed my hometown of Christchurch, the other wrought almost indescribable misery in Northern Japan. In the Christchurch quake the importance of public speaking has been evident, and the article below is my personal observation of some of what I've heard. Like a lot of Kiwis I watched the national memorial service broadcast from Christchurch last week to honour the nearly 200 people who died in the earthquake of 22 February 2011. It was, as is always the case in events like this, a showcase of various examples of public speaking, and there was in my opinion one outstanding example of oratory. I want to acknowledge it here, and explain why it stood out for me. 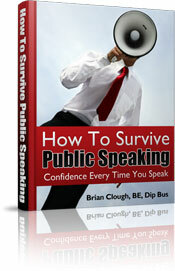 If you ever have to speak on a tough occasion, perhaps this might help you. The best speaking didn't come from the Queen's grandson, Prince William, although it was a quote from his speech which the media seems to have latched onto. Prince William's sentiments were welcome and kind and his very presence at the event was much appreciated. But he was reading a prepared speech. The best speaking didn't come from the Maori elder who opened the ceremonies with oratory in both Maori and English. He followed the traditional formula for Maori oratory, but he rambled a bit in english. The best speaking didn't come from the Governor General who read from a passage from Seneca. Again the sentiments were wise and even beautiful, but it was a reading of someone else's thoughts. No, on the day there was one speech of about 7 minutes, that was head and shoulders above the rest and that was delivered by the Mayor of Christchurch, Bob Parker. Here's why. The guy had huge credibility even before he opened his mouth. He's been the public face of the recovery effort, and people have marveled at his ability to communicate even when he's clearly exhausted. He also spoke without notes. This made a big impact on me and I think the audience. He seemed like someone who was totally immersed in the events and also totally committed to the recovery. He was real in a way that no other speaker was. Although you might think logic has little part to play on such an emotional occasion, shone through in his spech and added weight to it. He structured it around the lives of those killed in the tragedy being an inspiration to the living. This structure no doubt helped him find his way and stay on track. Logic also shone through as thoughtfulness expressed in the repeated phrase "It seems to me..." . A well used rhetorical device that made the speech more effective. He began by giving the crowd a voice in a way no other speaker did. He talked about the impossible but inevitable "Why us?" questions. He also ended with a rousing call to rebuild in honour of the dead and to give our children a most beautiful city again. This got spontaneous applause from the audience on a day when that seemed reserved only for the emergency services. Mayor Bob spoke from the heart with real feeling. He spoke with no notes because he didn't need them, and the audience loved him for it. He structured his speech in a thoughtful manner that allowed him to stay on track through what still must have been a difficult time. True to form, the media headlined a quote from a speaker of far greater celebrity. Of all the speakers, he was the one who related best to his audience. Perhaps because he was one of them. I hope you liked the newsletter. 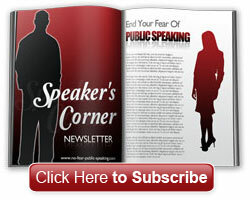 Have fun speaking with absolutely no fear.